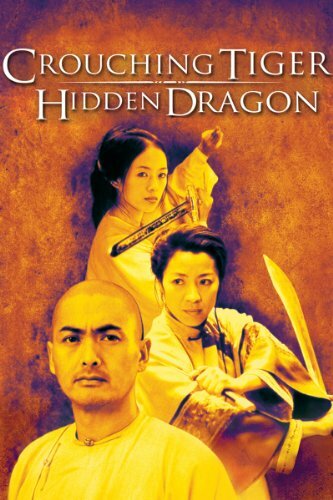 It’s lunchtime and I’m eating Chinese food and watching Crouching Tiger, Hidden Dragon. It’s just as breathtaking as it was when I first saw it in 2000. I remember a friend saying, “It’s like they made a movie out of my dreams.” It’s true, the film is definitely dreamy. The scene below is the famous fight that takes place in the treetops of a lush bamboo forest. The actors don’t seem bound by the rules of gravity. It’s absolutely mesmerizing. And the lunch was good too. I’ve been meaning to try making cauliflower fried rice for a while now. Today’s recipe is based on a really good recipe that I found on Keto Connect. I decided to add in some chicken and ginger and these additions turned out really well. Too well maybe. Both my husband and I ate so much of it, we made ourselves sick. So I think it might be nap time here at my house. Hopefully I’ll dream that I’m flying over the treetops. This recipe for lowc carb chicken cauliflower fried rice is a new take on classic Chinese take-out. 1. Cut cauliflower into florets and add to a food processor or high powered blender. 2. Pulse until it’s the consistency of rice. 3. Heat a skillet over medium-high heat and add 1 tablespoon of butter. Saute the chicken until cooked through, 5 minutes. Check that they are cooked in the middle by cutting them in half. Remove from the pan and set aside. 4. Add 1 tablespoon of butter to the pan. Add the riced cauliflower and flatten out over the entire surface. Allow to cook through for 10 minutes without stirring. 5. Stir rice and add onion, garlic, peas, ginger and season with salt and pepper. Continue to cook and stir over medium-high heat for 5 minutes. 6. Add the chicken back in and push the rice to one side of pan, grease the empty half with the remaining 1 tablespoon of butter and crack two eggs into pan. 7. Combine eggs and “rice” until eggs are cooked through. 8. Add soy sauce and sesame oil and combine well. 9. Garnish with scallions and serve immediately. If you liked this low carb cauliflower rice, then you might like my recipes for Coconut Cauliflower Rice, Cauliflower Rice Risotto or Chicken and Eggplant Biryani. I’ve watched this movie a thousand times. It’s so beautiful. Good recipe too. Thank, so glad you liked it.